Ironically, because of their role in the Hindu religion, it is generally not considered detrimental to keep or capture the primates in their native habitat. In addition to being sold for research, unfortunately langurs are often found for sale as pets. And some groups with different religious beliefs will hunt langurs for food and for medicinal purposes. Among the 350 animals at Primarily Primates, there is one unlike any other—and that’s hanuman langur Kalpana. Endangered hanuman langurs, named after the Hindu monkey-god Hanuman, are considered sacred in India. They are also found in Pakistan, Bangladesh, Sri Lanka and Burma. When Kalpana arrived at PPI from University of California Berkeley, where she was used for behavioral research, we received little information about her past. Our staff decided to name her after Kalpana Chawla, the first Indian-born female U.S. astronaut. Kalpana means, “idea” or “imagination.” She has a reputation among care staff for her gentle nature. She enjoys inspecting her care staff for any treats that may or may not be visible in their hands. Ironically, because of their role in the Hindu religion, it is generally not considered detrimental to keep or capture the primates in their native habitat. 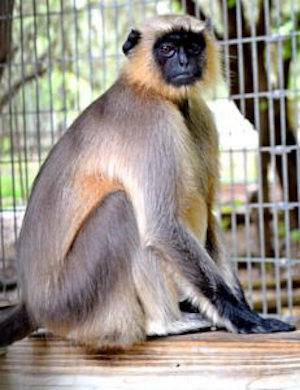 In addition to being sold for research, unfortunately langurs are often found for sale as pets. And some groups with different religious beliefs will hunt langurs for food and for medicinal purposes. The biggest threats to langur habitats in India include logging, encroachment, as well as plantation and slash-and-burn agriculture. Some notable characteristics of hanuman langurs are they live from sea level to 14,000 feet in altitude, the widest range for any primate other than humans; they eat 53 plant species and more insects than any other colobine; and they are the most terrestrial of any colobine, spending up to 80 percent of the day on the ground. Almost all feeding is within five meters of the ground. Interestingly, in their native habitat, the hanuman langurs may associate with rhesus macaques as they compete for human offerings around temples. To sponsor Kalpana, visit our website.